Our product range includes a wide range of ultra pure water generation systems and ultra-pure water generation systems. We are eminent names in the industry in offering a wide range of Ultra Pure to our patrons. These are made from optimum quality raw material under the visionary supervision of the best industry experts at our well-equipped infrastructure. Apart from this, for high strength and excellent damage resistance, these products are highly demanded in the commercial and residential sectors. We have a leading organization in offering a supreme quality assortment of Ultra-Pure Water Generation Systems to our customers. The offered products are tested in terms of quality to deliver only defect less range from our side. Extensively used in biotechnology, pharmaceutical, semiconductor and power plant applications, these systems are highly demanded. Customers can avail these systems at competitive prices. We design purified water generation systems for pharmaceutical applications as per prescribed standards of pharmacopeia, USP grades. Water is a very critical resource in pharma industry and could turn into a nightmare if it fails to perform as desired. With Marcuras you can sit back and relax and experience a world class system designed to eliminate all problematic issues. 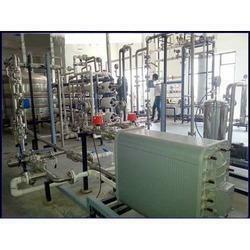 We take utmost care while executing such projects with proper selection of Pre-treatment, Filtration, micro and ultrafiltration, Nano-Filtration, Softening, Two pass RO system, Advanced EDI system, Ultraviolet sterilisers, Endo-Toxin filters etc. Chemical sanitized and heat sanitized systems are supplied with careful selection of MOCs that involve SS-316L, electro-polished, orbital welded pipes and TC fittings, sanitary zero-lag valves etc. We have excellent project execution capabilities and knowledge to execute distributions systems at site to ensure sterile water supply at user points. For other application like semi-conductor or power plant industries, similar systems are designed with other features such as nitrogen blanketing for avoiding air contact with purified water and a continuous recirculation through a pre-regenerated nuclear grade Mixed Bed resin to maintain the resistivity of water. 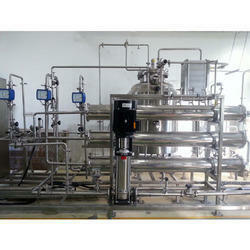 Looking for Ultra-Pure Water Generation Systems ?